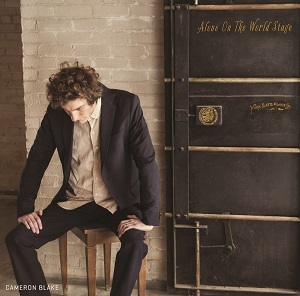 Folk singer Cameron Blake is back with his latest album (his fourth studio album), "Alone on the world stage". He performs solo - singing and playing either acoustic guitar or piano. It's a simple style but one that is very hard to do and keep it interesting - so many singer songwriters produce albums that are bland and forgettable. So, does Cameron Blake manage to succeed where other fail? In my opinion he probably just succeeds. The use of the piano instead of guitar for some songs does make a huge difference to the sound and helps keep the listeners interest for longer. Despite that it is still a bit bland musically for my taste, although if you like the singer-songwriter style then you may well find it more interesting. What saves the album though is the lyrics. Cameron Blake sings a lot of very topical songs from things like Middle East conflict to oil spills and social commentary, while "Ultrasound" is a more personal song about impending fatherhood. Overall then this is a good album - for me the lyrical content is what makes it worth listening to.